The battle of the big-box DIY centers may hinge on new housing trends. A growing housing market has sustained both Home Depot (NYSE:HD) and Lowe's (NYSE:LOW), allowing each to post exceptional fourth-quarter and full-year 2016 earnings reports that handily beat analyst expectations across the board on revenue, profit, and comparable-store sales. But as we head into the spring home-buying season, clouds are forming on the horizon. Mortgage rates are rising, there's a shortage of available housing to meet the demand, and new housing starts are dropping. That's a double-edged sword for the home-building supply warehouses because on one hand, they cater to the professional contractors building the homes, but on the other, do-it-yourselfers and home remodeling still comprise a big part of their business. Business from the one might fall, but it could rise from the other. With this changeable environment confronting the two biggest big-box stores in the home-improvement industry, let's see whether Home Depot or Lowe's makes for the better buy. Despite their apparent similarities, Home Depot is the bigger and more profitable of the two. While they have about the same number of stores in operation, Lowe's generates about a third less revenue, 60% less operating income, and half the free cash flow. That's because Home Depot tilts more toward the professional contractor -- who tend to buy higher value items -- while Lowe's leans more toward the homeowner. With housing having enjoyed a really robust 2016, which has been called the best year in a decade for the market, it's understandable that Home Depot edges out its rival. Yet with the changes underway in the industry, the field might begin to tilt now in Lowe's favor. Housing prices are rising, and with mortgage rates going up -- not to mention the number of homeowners still underwater on their mortgages -- moving on might not be an option for many. It will be tough to give up those lower rates homeowners have enjoyed, and with staying put comes the decision to fix up what you've got. The tides of renovation and remodeling will lift the boats of both Home Depot and Lowe's, but Lowe's business model specifically favors homeowners, meaning it may rise higher. Lowe's leading position in appliances and fashion fixtures may help it edge out its rival in gains for those who can't or won't sell their homes. The stocks of the two companies might not walk in lockstep, but they're still pretty similar. However, after Lowe's recent earnings report, the market rewarded it with a big surge higher that puts the one-year gains of both companies almost on par with each other. 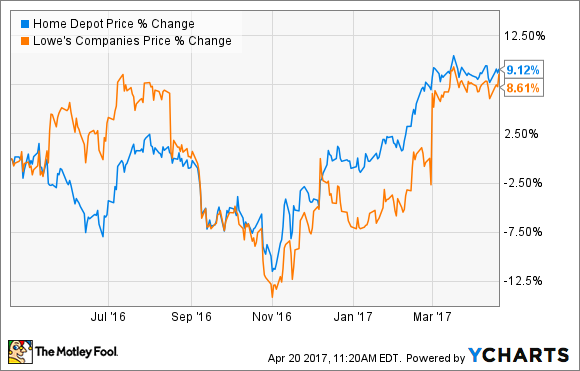 On a trailing-12-month basis, both Home Depot and Lowe's are comparably valued at around 23 times earnings, but when looking out over the next 12 months, Lowe's gains an edge with its price at about 15 times next year's profits versus Home Depot's 18 times earnings, though both are attractively priced in relation to the S&P 500 as a whole at 26 times earnings. Still, Lowe's is expected to grow earnings at a 15% annual clip over the next five years compared to less than 12% for Home Depot. With macroeconomic trends moving in its favor, Lowe's has the advantage, here. Both companies have their strengths when returning value to shareholders through dividend payments. Home Depot, for example, pays a dividend of $3.56 per share annually, reflecting the big 29% hike in the payout it just approved for the year. It currently yields about 2.4%. Lowe's dividend of $1.40 per share annually and yield of 1.7% seem much more mundane, but the DIY retailer has an impressive record of paying a dividend every year since it became a public company in 1961, as well as raising the payout every year for 54 straight years. Both companies have done well as housing finally recovered after the financial markets collapsed, and recent trends worked in favor of Home Depot's business. But things are changing once more -- and seeming to tilt in Lowe's favor now. While both big-box retailers are likely to do well regardless, the economic variables and Lowe's lower and better valuation -- particularly in relation to its future earnings growth estimates -- make it the better choice, however slightly.